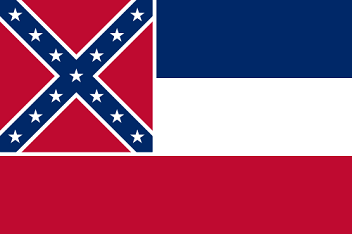 The red, white and blue canton style State Flag of Mississippi features the Confederate battle flag in its canton corner. The flag serves as a symbol of honor, heritage and regional pride and is displayed at state buildings. The Mississippi State Flag is also flown on national and state holidays and on any other days proclaimed by the governor. There is a strict Order of Precedence for flags. State Flags are displayed in order as they entered the Union. Car Flags are often displayed to represent of an individual's allegiance to their state. Mississippi State car flags are used by their owners as mobile emblems of their home. Car flags are usually made from strong materials and are attached to a car via a pole and clip window attachment. What is the design of the Mississippi state flag? The design is 3 horizontal stripes of blue, white and red. The canton is square, spans 2 stripes and consists of a red background with the Confederate battle flag's canton. What does the Mississippi flag symbolize? What are the colors on the Mississippi flag & what do the colors mean, or symbolize, in heraldry? Who designed the Mississippi State Flag? What is the history of the Mississippi State Flag? The popularity of the magnolia tree design led to the famous nickname of the "Magnolia State"
2001: A proposal to remove the Confederate battle flag was defeated by Mississippi voters who elected to retain the original design. What is the Mississippi Pledge of Allegiance and Salute? under the guidance of Almighty God." The salute should be made by standing at attention facing the Mississippi flag with the right hand over the heart. 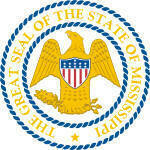 The Mississippi flag is kept and used as required by the code specified in the constitution of the state.